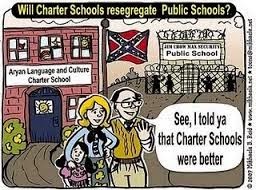 We revisit the world of charter schools with Dan Arel's post at Alternet.org, "Why Religious Fundamentalists Are So Excited About Charter Schools," subtitled, "Two new Republican proposals could be a boon for the prospects of publicly funded religious education." 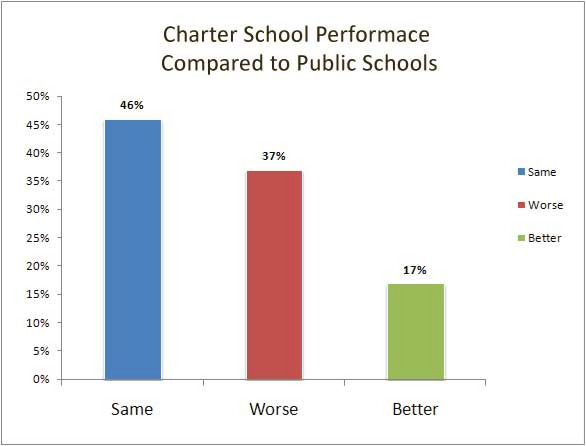 Today's post is in addition to three previous posts telling you everything you needed to know about charter schools: Conservatives Hate Education, Charter Schools = Goodbye, Middle Class!, and The Last Word On Charter Schools As Their Teachers Scramble To Unionize. 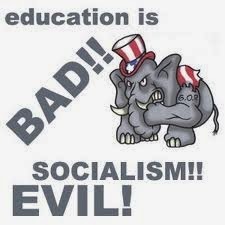 "It is no secret that Republicans dislike public education. They view it as a burden on the taxpayer and do not believe paying for someone else’s kid’s education should be their responsibility. Just this month Senator Paul Ryan (R-WI) was quoted at the Conservative Political Action Conference (CPAC) saying that kids who receive free school lunches have parents who do not care about them at home. "Ryan, like the rest of the Republican Party, sees public schools as a free handout, a program used by poor people who cannot afford private school and a secular institution that removes God from kids’ lives. They also know that everyone’s tax dollars pay for this and they have a plan to stop it. "Enter school vouchers. Not a new idea by any means, school vouchers came into being nearly 140 years ago in Vermont and Maine, but not how we know them today. In 1955, economist Milton Friedman brought them into the national spotlight in a paper titled, 'The Role of Government in Education.' The whole plan was a way to fund private schools and tuitions with taxpayer dollars. Though the program introduced by Friedman gained little steam at the time, the ideas sat around the Republican Party think tanks for some time, and starting in 1989, the idea started to take off. "In 2012 Louisiana Republican Governor Bobby Jindal introduced legislation allowing parents to use vouchers to send their children to private schools. These vouchers work something like scholarships where poor students may be taken out of the 'failing' public school and placed into a private religious school. "Jindal only placed about 8,000 poor students in the entire state into these private schools and the data from the LEAP testing done each year showed that those students in the private schools scored drastically lower (40% at or slightly above grade level) than the state average (69%)1. "White showed that taxpayer dollars, through the voucher system, are paying for educational institutions to discriminate based on religion and sexual orientation. Though the Unites States Constitution strictly prohibits this discrimination, these religious schools have learned to exploit loopholes through church and state separation. "The private schools do not have to teach science in the same way public schools do. Louisiana private schools are known for teaching that Darwin was wrong, and that the answer to how life came to be on earth is not evolution but creationism. They have also taught that the Great Depression was overblown by liberal propaganda. "This voucher project has not been deemed successful in Louisiana. Failing test scores and the butchery of science education on taxpayer dollars has left the state with subpar educational standards, money diverted from public schools to religious institutions and rampant discrimination. "After looking at this experiment, the Republican Party must be ready to shelve this idea, right? Not exactly. "On In January 2014 Sen. Lamar Alexander (R-TN) introduced a bill to the Senate titled Scholarships for Kids (S. 1968 /H.R. 4000). The bill is a nationwide voucher program that would turn 63 percent of public school education funds into private school vouchers. Now, Alexander’s bill does not touch federal education money for subsidized school lunches, students with disabilities, and students in schools on federally impacted land or military bases, but the Republicans have that covered too. Sen. Tim Scott (R-SC) introduced his bill, the Opportunity for Individuals and Communities through Education (CHOICE) Act, to expand educational opportunities for children with disabilities, children living on military bases, and children living in impoverished areas. "If you think that sounds too good to be true, it is. Scott’s bill is a voucher system for those who need the funding most. Alexander’s and Scott’s bills combined would devastate the public school system. Together these two bills would turn all federal educational funding into vouchers and students living in poor, rural areas and students with disabilities would lose out. "The private school system, which is predominantly comprised of Catholic or Christian religious schools, would benefit greatly by not only receiving tuition fees, but also government funding. They would be free to teach whatever religious-based education they please while taxpayers pick up the tab. "Politico went on to report about the standards of scientific education in these schools and that Zach Kopplin, a student activist fighting for a proper scientific education in the US, found that in more than 300 voucher schools teaching biblical creation, some are even going so far as to teach young earth creationism—the belief that the earth is only 6,000 to 10,000 years old. "Despite its failures, the Republican Party has been able to sell vouchers as saving taxpayers’ money while also giving them a choice in their children’s education. The idea has become a rallying cry of the Tea Party members and Libertarians inside the Republican Party. 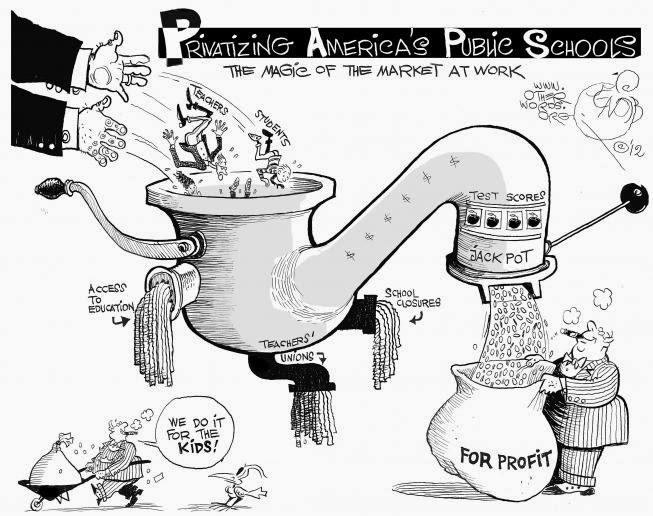 Libertarians see this as a step toward the privatization of education, removing government from the equation completely, and putting your child’s education on the free market. Former New Mexico governor and 2012 presidential candidate Gary Johnson was known for his voucher program launch for childcare in New Mexico, which resulted in a large boom in business for unregulated religious childcare institutions. 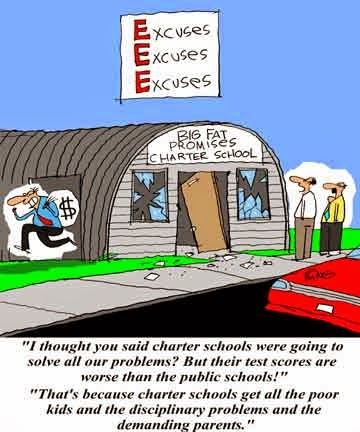 "Many parents fall victim to this propaganda because they are unable to afford to send their children to fancy private schools and believe voucher programs will give them access to an education better than what's available at public schools. Sadly, what these parents are left with are kids who get rejected from the school voucher scholarships and are made to return to their now more poorly funded public school, if they are lucky. Why lucky? Because overfunding private schools with vouchers will mean closing many public schools in the poorest of communities and forcing parents to drive one to two towns over to get their children to school." 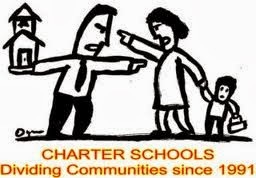 Charter schools are nothing but "...a way to fund (subpar) private schools and tuitions with taxpayer dollars" to kill off our public school system in favor of schools based on racist and religious biases. Do you want your children to learn that the earth is only 6,000 years old? Public funding of commercial enterprises is the dream of every Conservative, cramming their religious and racial misbeliefs down our children's throats, but to others it's a criminal act. Remember the word "voucher." It's dog whistle language for "kill education," and the bogeymen Communists of the '50s couldn't have done it any better.